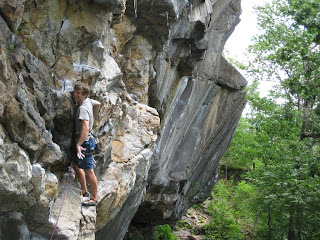 Rumney has to be one of my favorite sport climbing areas in the country. Beautiful rock tucked away in the rolling hills of New England. The various crags offer a variety of angles on interesting rock of many different colors. 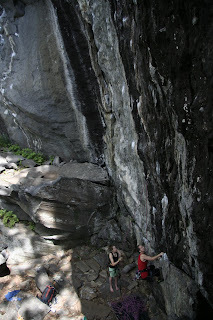 Climbing mid week we were able escape the Rumney scene that has developed in recent years. It seems fitting that I returned to Rumney en route to my friend Adam’s wedding for it was with him that I first visited Rumney. On my first and only other trip to Rumney Adam and I headed out for the 7+ hour drive from Bucknell on a Wednesday night. Some how we were both able to play hooky for a few days and wanted to get a bit of climbing in before the snow set in for the winter. We drove north through pouring rain too excited and stubborn to let the weather effect our mood. Despite almost two and half days of rain on a 4 day trip we had a blast, sent hard and vowed to come back to our unset projects. This trip was to be my glorious return to Rumney and we sure had a blast. Lizzy and Rebecca had never been to Rumney and I was excited to show them the many fun climbs Adam and I had played on over a year previous. Our day started at Waimea and we had the cliff all to our self. The sun still hiding behind the rocks and we enjoyed to cool shade. The name sake climb and the easiest on the wall is Waimea 10d. 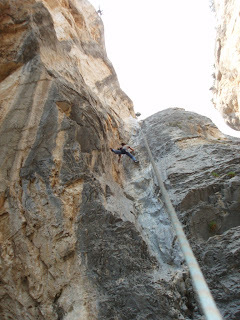 This climb follows black water streaks up a vertical wall to a tricky crux on runnels and feet pointing the wrong direction. Waimea sits next to some of the hardest routes at Rumney and while moderate in grade can be quite pumpy. In the second photo you can see Livin’ Astro 14c, China Beach 14b, and Jaws II 15a. While not a great warm-up for those climbing 5.11 it was our only option. Lizzy was able to work through a trick top crux, ignoring my incorrect beta, and set despite a dizzying flash pump. Rebecca quickly worked her way up to the crux and could not figure out the sequence and took a nice clean lead fall. Working on her mental game she got back on the route and finished it up. My main goal and unsent project from my last trip was Techno Surfing 12b. On my final burn last trip I had fallen post crux with only one draw between me and the anchors. While the technical crux is much lower there is one hard move right before the last bolt and then you are quite pumped making the final moves to the anchor. On my first try I wimped out at the crux and took. I was a bit out of my mental space and was not excited to see the same fixed draws on the route as the last time i had been on it almost a year and half earlier. I hung my way up the route and figured out all of the beta and lowered to rest. Lizzy was busy taking a nap recovering from our late night and day of travel so Rebecca went to work on Flyin’ Hawaiian (photo below). I had history with this line and was excited to see how it would feel. The start was quite bouldery with difficult moves over a rocky landing so we stick clipped the first two bolts. Rebecca worked through a good intro sequence but was falling off a strenuous left hand pinch. Lizzy woke up rested and excited to give it a go. She was able to refine the start beta and match the left pinch but could not keep body tension to get her feet up and make the next move. After many tries the ladies opted for some rest and I got back on Techno Surfing. The first hard moves went well (photo below) and in no time I was resting below the crux bulge. I started off into the crux sequence and then the rope got stuck on my harness buckle while I was trying to clip. I dangled from the two handed jug and waved my legs around. Helpless to change it I heel hooked above my head and clipped. Energy sapped I forced my self to continue and made it through to the next ledge rest. Commitment and fast movement would be key for the last hard move. I crimped hard with my left hand committed and a few moves later found my self clipping the anchors. Next I lead Flyin’ Hawaiian which was just as hard as I remembered and Lizzy and Rebecca top roped it. They both found it thuggish and fell at the tricky moves that gained the upper dihedral. Hoping to get in some more enjoyable for the girls we headed over to Orange Crush. This wall is steep at the top but offers some nice vertical lines in the middle of the cliff. I had hoped to link the full Black Mamba which Adam and I had done in two pitches but the top section was seeping. Technical moves on beautiful black rock make this route one of the best 5.11’s at Rumney. The vertical small hold climbing allowed the girls to use their balance as they danced up this route. Rebecca enjoyed it so much she did it twice. Both Lizzy and Rebecca vowed to lead it when they return. I had time to finish up one more project and got on Captain Hook. It was a bit warmer and more humid at Orange Crush which was less than ideal for the small crimps on this route. After hanging the draws and remembering the beta I was able to send on my second try. The first crux deadpoint was much harder than I remembered but I was in control and only mildly pumped at the top crux. Also I found a left kneebar that allowed me to easily clip the anchors. We were all tired and it was getting late so we got pizza in town. A nice treat after a long day of hard climbing! It was great to get back to Rumney and I cant wait to return! I needed to get out, I just wanted to leave, go somewhere, change the flow of things. But I am not a spontaneous person, I like to make plans and follow them. This balance always strikes me and I don’t know what to do, which furthers my problem. I like doing things, keeping busy and chugging forward. I enjoy keeping my schedule full so that when I do have some free time I enjoy it and truly relax. Friday came around and plans for the weekend were far from settled. Lizzy had been spending time in her Air Conditioned room away from 100+ degree heat while I had been plugging along at work. Even climbing in the shade we would be met with 90+ degree weather and would likely melt before sending anything. Our drastic times called for drastic measures and I came up with a plethora of plans. This can easily become a problem as Lizzy and I try to sort between the nuisances of each possible climbing location. The common theme was high elevation and camping. We would need to spend the whole weekend out of LA and somewhere cool. Fearing the hoards and with a slight dislike of the granite of Big Bear we decided on Mt Charleston. Gas these days I at a premium and adds new words to the American vocabulary like “Stay-cation” but honestly who the hell wants to do that. I want to explore the world, I want to journey to new places and I want to get out of here. NOW! Adjusting to meet the best temperatures I worked on Saturday and we left for Vegas on Saturday night. The five and half hour drive was traffic free but required constant AC as we made our way into the Vegas heat. After passing by the strip we headed north on the 95 out into the unknown. 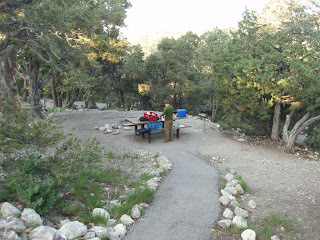 A small turn off and a sign for Mt Charleston signaled our rise to elevation and a retreat into cooler temperatures. 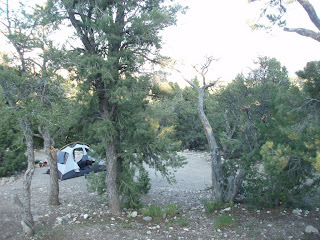 Reservations were suggested but required three days of advanced notice for the Kyle Canyon Campgrounds. With the two main campgrounds full we headed to the Mary Jane Area. This multiple abuse site, once home to a historical ski tow, was a gravel parking lot near the Mary Jane trailhead. All of the “spots” on the periphery were taken so we parked near the center and set up our tent. Bugs instantly flocked to our headlamps but the temperatures had dropped and we were quickly asleep. 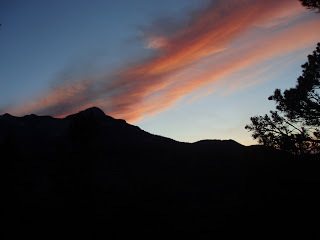 With the sun rising around 5am, I was excited and anxious to go climbing. Getting up to go to the bathroom at first light I had seen towering limestone walls and had a hard time going back to sleep. Unable to wait any longer, I roused Lizzy and we packed up and had breakfast by 6:30. After a bit of confused driving, undoubtedly caused by our mere 6 hours of sleep, we wound up hiking up the trail next to the ski tow. 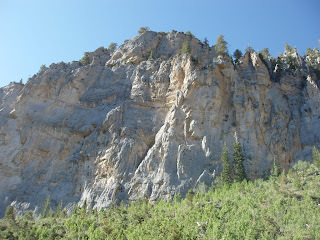 Our trail led us to the base of the north facing Imagination Wall, 500 feet of glorious limestone. At the base of our warm-up the rock was intimidating and devoid of familiar features. Sharp crimps and runnels dotted the face and without chalk the sequence was far from obvious. 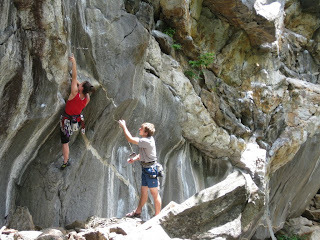 The base of the Imagination wall is slabby and the rock offers excellent friction, the climbing requires subtle body movement and a keen eye for “holds”. After warming up I jumped on a 10d that might make a good lead for Lizzy. This however was far from the truth. After breaking a foothold, stick clipping the second bolt and shakely climbing to the 3rd bolt at 40 feet I decided to bail. The next bolt was 15 feet higher and I was not yet confident on this type of climbing. I had fallen prey to the Exacto Blade (the route’s name) and did not have the mental energy to complete this route that was undoubtedly bolted on lead. Confidence shattered, we moved down the cliff to try a few of the other “moderate routes”. After bailing on three different variations of this 11a, I found passage on one of the harder neighboring routes. While not a clean lead I was finally able to make it to the top. The ending of this 11b had what I wanted, wonderful pinches and crimps, tricky footwork and tension moves, most importantly real HOLDS! Finally getting to climb after my flailathon Lizzy mad quick work of this balancey climb. After one more fun 11b, evidently the good grade to climb at this wall, and a bit of heinous top roping we departed for Robbers Roost. The weather had been ideal and the wall was completely in the shade causing Lizzy to don all of our jackets. Even though we were a bit tired I convinced Lizzy that more climbing was in order and with the promise of a five minute approach we were on our way. The scene at Robbers Roost was the opposite of the solitude of the Imagination Wall. There were tourists and climbers sandwiched in the cave like venue. The walls were covered with fixed draws and chalk and most of the climbs were overhanging. With some friendly advice from one of the locals we warmed up again and we did a few more climbs. While these routes had tricky cruxes they had nice holds and jugs and one even had a sit down rest. Excited by a more athletic style we decided to return the next day so Lizzy and I could work on some harder routes. Hilltop, the third campground in the area, was close by and we still needed a place to sleep. With showers and a toilet this was a big step up from the Mary Jane Area. Hiltop hade excellent views and is about 1000 feet higher than Kyle and Fletcher campgrounds. Since it was Sunday night we had no problem finding an excellent site in the shade. If you are ever there I suggest site number #21 despite not having a view it was fairly wind protected and had evening shade. 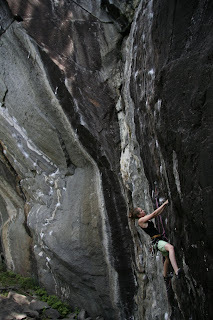 Monday we returned to the Roost and climb the namesake route (photo below). This climb, another lead bolted scare fest, was technical with bad falls on sharp rock. The movement and hold variety was classic limestone and excellent if you could move past a fear of falling. 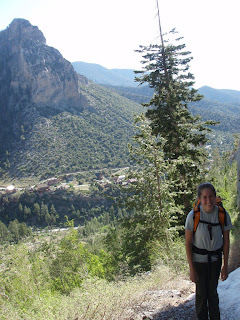 This climb had deep runnels and great pinches. I found the crux to be a tricky bit of stemming after a good rest about midway through the route. While this did not function as a good mental warm-up it got the blood moving and allowed me to focus on harder routes. First up was an onsight attempt on a route that had been occupied the previous day. After a bunch of tricky climbing I gave up a foot below a hidden jug. Lack of commitment and a bit of memory loss left me hanging but with no regrets as I made my way to the top I encountered a much more beta intensive crux that would have blown the onsight. Next go, much more relaxed, I sent Bubbleicous. Lizzy was in the projecting mood and jumped on Los Banditos, an 11c that she had done clean first try on TR the day before. This would be her first of the grade and over the day she made excellent progress. Between my attempts on different routes she gave this route three good burns and on her final try fell one hold below jug at the end of the crux. She made good progress with each try and feeling fresh on our next visit I think this climb is within her reach. I attempted some of the classic harder routes in the area but was stopped by tricky beta, fatigue and altitude. Leaving tired we made the journey back to San Diego happily avoiding Vegas rush hour. Despite a lack of hard sends I feel the weekend was quite satisfying and have a new respect for the complexity of limestone. 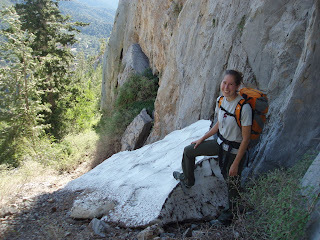 I am excited to go back, since according to the locals you can climb there all summer. A climber’s mental attitude has everything to do with how he or she is going to perform on a climb. While hesitation and commitment can be lumped in with motivation I want to explore these mental elements as they effect the moment. The thoughts that are rushing through your head as you climb above your last piece or try to top out a boulder problem are very insightful. How can a climber improve their mental game so that the negative self talk can be reduced or eliminated? When climbing a route or problem I think that climbers exert varied amounts effort throughout the duration. While the amount of physical exertion may be easy to gage the amount of mental effort can be harder to comprehend. Some times on a climb it can be very important to keep the right mindset even when the difficulty eases. A climb may be runout, have serious fall potential or a bad landing where hesitation could cause an unsafe fall. Keeping focus all the way to the top will help to insure success. Comprehension about the gravity of a situation can have large consequences on the ability for a person to perform the needed actions. Many times a climber can deal with runouts and dangerous situations because they are not fully aware of the potential consequences. A climber can be unnerved when their belayer warns of ground fall danger or other possible problems that the climber thought they had under control. This mental insecurity can easily translate into a bigger problem if the climber starts over gripping or making bad decisions. There are different mindsets that I think can be very helpful when climbing in order to be more successful. Pressure to send a route can be problematic when it causes a climber to be tentative or worrisome. Being able to be in the moment and distance ones self from expectation and pressure can be quite helpful. 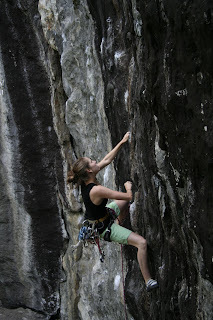 Many climbers do not recall the details from hard sends because they were fully engaged in the moment. Being in the zone does not solve everything; being able to have control over your emotions can be as powerful if not more so than the zone. A problem with climbing in the zone can come when you snap out of it when the climbing becomes more difficult than expected and you are not properly prepared. Willingness to commit to difficult movement can be necessary and mental toughness is necessary. A mind set that allows commitment without taking difficulty for granted is very powerful. Expectations of a route can have varied effects on a climber. Some climbers are easily intimidated by cruxy routes while others fail to maintain mental energy through sustained climbs. 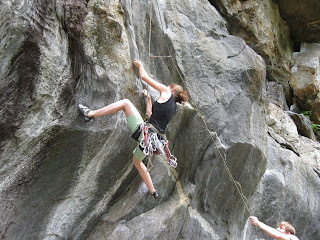 Knowing where a crux is on a route should give the climber an advantage because it allows them to mentally prepare for the complex or difficult sequence. 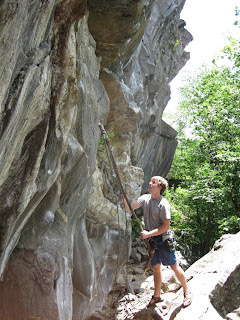 A climber can make sure that they are rested and willing to give 100% to the next section of rock. We as climbers must strive to conquer our fears and hesitation and give a genuine effort. As the act of climbing becomes more challenging I find my self more engaged in the movement. Clipping bolts and placing gear become integrated into the climbing motion and I am not overly worried about fall potential. Many times when I fail to assume the right mind set or am worried about falling I will dwell on the gear or bolts. The action of clipping a bolt does not help a climber recover lost energy but it often helps bolster a climber’s confidence. Many times I will feel much better after placing a cam even though the difficult of the climbing has not eased. Looking at how climbing changes our mental state will ultimate lead to both a better understanding of ourselves and a break through in our climbing. Climbing highballs out at bishop this past weekend really made me think about how mental climbing really is. I would be perfectly able to do all of the moves on a climb but my body would not allow me to continue when I would climb far off the ground. Conquering this fear would open a new realm of climbing and it will be interesting to see how I can deal with fear in the future. 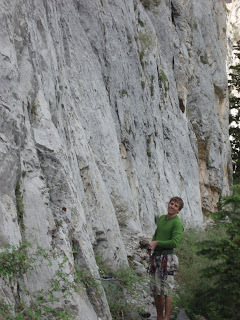 As I have been attempting more “hard” routes recently I have been mulling over the concept of grades. Within a given number, whether 5.9 or 5.13, the variability of perceived difficulty can be quite vast. Rock type can vary between crags as can the grading ethics and the style of climbing. 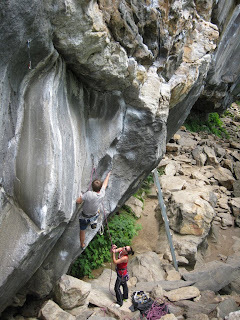 How can we relate a 5.9 on Yosemite granite to a 5.9 at the Red River Gorge? At one point our grading system rated a climb based on its hardest move, but now we try to rate the overall effort required for a climb. Sustained 5.9 moves yield a rating of 5.10a at certain crags despite the lack of a 10a move. These ideas are not set in stone nor are they agreed upon throughout the world, yet people all over base so much on these simple numbers. Is this because we need an expectation for the route we are going to climb? Do we need compare climbs to each other and to our past climbs? What do we need from these grades? I found this quote about Dave Graham’s feelings on grades quite interesting. It was originally posted here. “Do we comprehend as a community a system of grading? As a community, are we confident in our current theories about the complex abstraction of high-end grades? I think the media did a lot more consolidating of grades than we ever did as a community of climbers. For generations it has happened. Capitalism, money, “fame”,…these factors of our world are real, and they have a serious influence. I completely agree that climbing is too complex to be expressed by “a little number”. As a community we should work together to push the limits of climbing and make sure not to be confined by grades. This article really sheds some light on the John Gill B scale. It is cool to see that a younger climber, Klem Loskot, agrees with Gill and his explanation of how to grade difficult problems is insightful. It is especially important how he says that grades should really just be a personal reflection of the difficulty of a climb. Also that sometimes the best way to look at the difficulty of a problem can be its relation to other climbs you have done. Personally I use grades as a measure of performance and a way to gauge progress. I target grade ranges when I travel to crags so that I will push my self climbing. In the past I have been too concerned with sending given grades at the sacrifice of other parts of climbing. I would climb 11as instead 10ds since they are the next number grade up and thus more important even thought both grades be quite similar in difficulty. While I do think the grades do characterize different types of movement I can still be surprised by the effort required to do 5.9 versus 5.12. Just because a climb is graded harder doesn’t always mean it is more difficult. 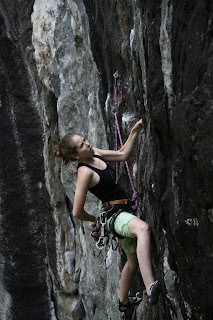 Difficulty is so abstract, especially in climbing, because there is a varied mix of mental and physical effort. A climb can seem more difficult if the moves are harder to unlock compared to a climb with simple pulling. Technique or the lack there of can make a huge difference especially when one climbs outside versus in the gym. 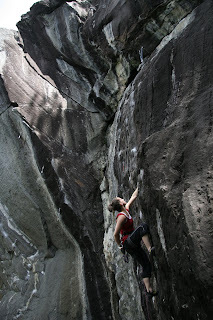 Overall I think that the most important thing is to keep climbing and trying different styles of routes. A person’s body can learn so much from a variety of challenges. After many years of climbing cruxes will make more sense and perhaps grades will seem less important. The key is to challenge yourself and have fun doing it.